Memphis, TN (October 30, 2018) - Coaching for Literacy (CFL) and Jonathan Isaac are teaming up to benefit school children in Orlando from kindergarten to 3rd grade. Isaac will host a Fight for Literacy Game on December 5th when the Orlando Magic face off against the Denver Nuggets. Fight for Literacy Games raise awareness about the issue of illiteracy and generate financial support for effective, local literacy programs. As Jonathan takes the court on December 5th, he'll wear the color green to call attention to the importance of grade level reading. Per the National Assessment of Educational Progress (NAEP), 59 percent of 4th graders in Florida do not read at the proficient level. To help change the stat, Magic fans can pledge a donation for each point Isaac scores during the four-game window from December 5 to December 13. One hundred percent of the funds raised will remain in Orlando to provide support to children participating in Orange County Public Schools Read2Succeed (OCPS) program. Jonathan Isaac will match up $5,000 of fan donations. To Fight for Literacy with Jonathan Isaac and OCPS please visit www.fightforliteracygames.org/isaac. In his debut season with the Magic, Isaac displayed flashes of promise that have Orlando fans excited about the upcoming season. This promise of success on the court is matched by a willingness to make a positive impact off the court, a desire that was formed during his time as a member of the Florida State Seminoles. As a Literacy Ambassador for Coaching for Literacy, Isaac lends his influence to support over 32 million illiterate Americans who struggle to complete everyday tasks like filling out a job application, registering to vote, and following instructions from a medical prescription. Thanks to the support of its partners, Coaching for Literacy has conducted 103 Fight for Literacy Games funding over 75 literacy projects across more than 20 communities in 16 states and directly impacting over 10,000 children. The mission of Coaching for Literacy is to use the power of sports to raise awareness about the problem of illiteracy and generate financial support for literacy programs nationwide. To learn more about how you can make a difference for literacy efforts in your community, visit coachingforliteracy.org. International Paper teams up with Coaching for Literacy to provide young students in six states the fundamental skill they need to be successful: literacy. Memphis, TN - (9.4.2018) - In celebration of International Literacy Day, International Paper announced that they are continuing to support Coaching for Literacy’s Fight for Literacy Games initiative to benefit school children from kindergarten to 3rd grade. During Fight for Literacy Games, partnering coaching staffs wear the color green to promote literacy awareness across the country. International Paper is set to contribute $500,000 to generate literacy awareness and provide critical financial support to advance the work of effective local literacy programs. International Paper will sponsor six Fight for Literacy Games during the 2018-2019 NCAA men’s basketball season with the following teams: Alabama, Iowa State, Georgia Tech, LSU, Memphis, and South Carolina. Last season, International Paper’s Fight for Literacy Games with LSU and Memphis men’s basketball helped children like Jaden, a rising 3rd grader in MTR Camp, a summer education initiative in Memphis. During five weeks of camp, he received valuable literacy instruction from trained coaches and read books like The Secret Garden provided through the support of International Paper. Fight for Literacy Games equip young students with the literacy tools they need to be successful. Coaching for Literacy’s 100% Impact Promise ensures each donation made by the general public will provide a direct, positive impact in the lives of aspiring readers at MTR Camp. To join International Paper in support of local literacy work through this season’s Fight for Literacy Games please visit www.fightforliteracygames.org. International Paper (NYSE: IP) is a leading global producer of renewable fiber-based packaging, pulp and paper products with manufacturing operations in North America, Latin America, Europe, North Africa, Russia and India. International Paper produces corrugated packaging products that protect and promote goods, and enable world-wide commerce; pulp for diapers, tissue and other personal hygiene products that promote health and wellness; and papers that facilitate education and communication. International Paper is headquartered in Memphis, Tenn., and employs approximately 52,000 colleagues located in more than 24 countries. Net sales for 2017 were $22 billion. For more information about International Paper, their products, and global citizenship efforts, please visit internationalpaper.com. 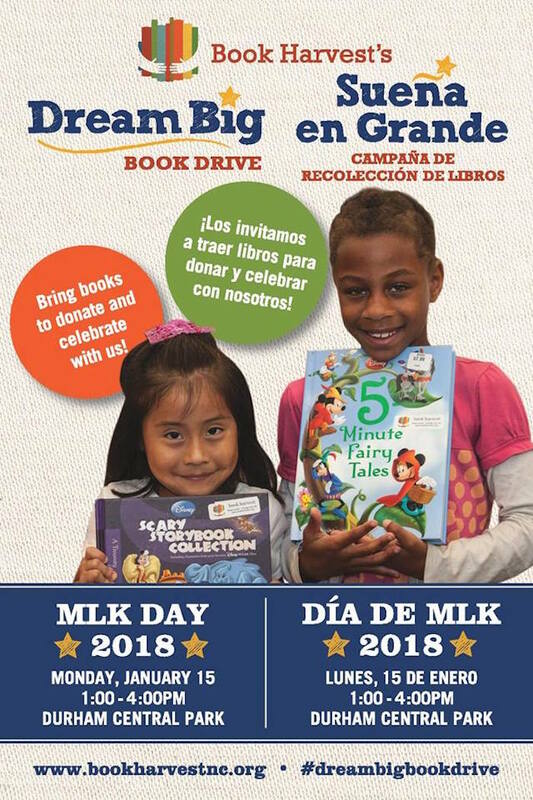 Each year since 2012, Book Harvest has marked MLK Day with a community-wide celebration of diversity, literacy and books for all children : The Dream Big Book Drive! On January 15, 2018, we gathered at Durham Central Park to enjoy fabulous entertainment, participate in games and creative family activities, meet some of our favorite mascots, and of course donate lots of books and prepare them to be shared with our community's kids! We collected 43,172 books, we served and celebrated alongside 802 fellow community members, we led 82 book drives in anticipation of the big day, and we raised $60,400 from 66 generous sponsors! Book Harvest's annual Dream Big Book Drive is inspired by Dr. King's vision of a world in which every child has the chance to realize his or her full potential. Book Harvest works all year to help children build home libraries with books they love and support families in achieving their family goals. Learn more and get involved at www.bookharvestnc.org! Students who don’t get reading support during the summer lose two months of skills during their break from school. That’s why Readers 2 Leaders provides six weeks of high-dosage tutoring to 90 West Dallas students each summer. This year, students in our programs actually gained four months of skills! They will go back to school ready to learn, and a $1,409 gift from Southern Methodist University Fight For Literacy game fundraising helped make that possible. Fight For Literacy donors’ support helped children like Kharma, a rising 5th grader in 2018’s Team Read Summer Camp. During the six weeks of camp, she made crafts and read mystery books like The Secret Garden. Kharma started the summer at Tier 3, more than a year behind grade level. Because of her hard work and the help of her instructor and Reading Buddies, Kharma ended summer at Tier 1, meaning she will start 5th grade on level and ready to excel! Readers 2 Leaders serves students throughout the year with high-quality reading tutoring that helps them catch up to grade level. We thank Peter Millar, Coaching For Literacy, and all our partners for believing in Dallas’s young readers and making sure they have the help they need to thrive. With a vision that all children be prepared for success in school, the Early Learning Coalition of the Big Bend Region (ELC) is making moves with their early childhood literacy program called My First Books. The program was originally created to ensure that any and every child who entered their offices would leave with a children’s book from one of their “Word Gardens”. Soon, it became very clear that not all children would ever cross paths with their programs or services and ELC needed to continue their efforts outside their doors and into the communities they serve. This year, ELC was honored to have been a partner with Coaching for Literacy and the Florida State University’s Men’s Basketball Team. The partnership allowed for an opportunity to expand awareness and access to early childhood reading in the Tallahassee community during the annual Word of South, a free, music and literature festival. Because of the $1,466.31 that was raised, ELC was able to sponsor providing more families with copies of children’s books that were written and illustrated by authors and artists who were being showcased at the festival. Families would enjoy presentations of children’s books and works throughout the park. After, they would be directed to the Early Learning Coalition’s tents, where they would be greeted with a new book, a pillowcase printed with the words, “Read to Me My First Books” and the opportunity to meet and have their books signed by the authors and illustrators themselves. Initially, parents wondered about the books with the pillowcases, but they soon realized a pillowcase is the last thing a child sees before bed. What an easy way to remind the parent and the child that bed time is a great time to read their new book or any book. The ELC believes all children deserve to have access to their own little library of books, but they also believe that families, as a whole, need to understand the importance of reading and reading often, while keeping it engaging and fun! Over 500 families came by the Early Learning Coalition tent the day of the festival. A number that could not have successfully been reached without this amazing partnership. A huge thank you goes out to Coaching for Literacy for its mission and vision and to FSU Men’s Basketball for trusting the process. The ELC is honored to have been chosen to further spread literacy love in the Big Bend Region. Memphis, TN (3.1. 2018) – On February 11th, the Memphis Tigers Men’s Basketball team hosted the UCF Golden Knights. The contest on the floor was joined by a contest off the floor: the fight for a more literate America. Per a recent report by the Commercial Appeal, only 21% of third-grade students in Memphis tested proficient in reading last year. On Sunday, International Paper, Memphis Men’s Basketball, and Coaching for Literacy teamed up to change that statistic by hosting a Coaching for Literacy Fight for Literacy Game. The importance of literacy was highlighted by the attendance of International Paper’s special guests for the game: students and teachers of a local literacy organization, Memphis Teacher Residency. Thanks to International Paper and Memphis basketball fans, Coaching for Literacy’s Fight for Literacy Game initiative with the Memphis Tigers netted nearly $8,000 for Memphis Teachers Residency’s MTR Camp, a summer learning initiative aiming to reduce learning regression. “Literacy experts agree that reading over the summer is crucial to literacy growth, yet children in low-income households will fall behind their wealthier peers by three months, on average, in reading level each summer," said David Montague, executive director of Memphis Teacher Residency. "The funds raised from International Paper and Memphis Basketball fans demonstrate the collective power to affect change for the common good." Although a Tigers game at the FedEx Forum is typically dominated by the color blue, this matchup featured Coaching for Literacy’s signature Green for Literacy apparel, worn by Head Coach Tubby Smith and the entire Memphis coaching staff. Nearly 1,000 International Paper employees joined in by sporting green shirts to reinforce the importance of reading at grade-level by the end of third grade. The Memphis-based producer of fiber-based packaging, pulp, and paper works hard to create value for generations to come. While the end of the basketball season will bring a well-deserved break on the court, Memphis Men’s Basketball will begin their literacy efforts off it with International Paper employees. They will join together to read with students at MTR Camp this summer. Coaching for Literacy is partnering with more than 40 NCAA programs in this season’s Fight for Literacy Games initiative. Thanks to the support of sports teams and generous donors, Coaching for Literacy has funded over 50 literacy projects across 20 communities in 11 states directly impacting 8,000 children. The mission of Coaching for Literacy is to use the power of sports to raise awareness about the problem of illiteracy and generate financial support for literacy programs nationwide. International Paper (NYSE: IP) is a leading global producer of renewable fiber-based packaging, pulp and paper products with manufacturing operations in North America, Latin America, Europe, North Africa, India and Russia. International Paper produces corrugated packaging products that protect and promote goods, and enable world-wide commerce; pulp for diapers, tissue and other personal hygiene products that promote health and wellness; and papers that facilitate education and communication. International Paper is headquartered in Memphis, TN. and employs approximately 52,000 colleagues located in more than 24 countries. Net sales for 2017 were $22 billion. For more information about International Paper, their products, and global citizenship efforts, please visit internationalpaper.com.